SPOKANE, WA – The saying goes that you need your big players to come up big in big games. The Americans got that, along with a Game 1 win on Saturday night. 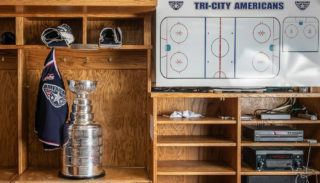 Team captain Kruise Reddick collected a goal and an assist, while regular season co-MVP Drew Owsley kicked aside a playoff-high 34 shots, as the #3 Tri-City Americans (5-0-0, 10 pts) earned a 3-1 win over the #2 Spokane Chiefs (4-1-1, 8 pts) in front of a raucous 8,215 fans at Veterans Memorial Arena. 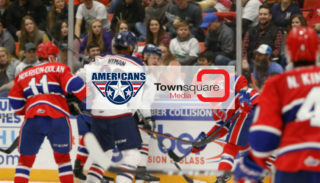 With the win, the Americans stretched their current winning streak to a season-best eight games, including five straight in the post-season, matching the franchise high for consecutive wins in a playoff year. Meanwhile, the Chiefs will look to pull even in the best-of-seven series in Game 2, set for tomorrow at 6:05 in Spokane. Tri-City, which had lost in their last three trips to Spokane Arena by a combined score of 15 to 4, got off on the right foot, scoring just 3:41 into the contest. After blocking a Spokane shot, Paul Sohor got the puck up to Jordan Messier, who let a shot go on James Reid. Reid, unable to control the rebound, saw Reddick swoop in and bury his first goal of the playoffs. Nearly 10 and a half minutes later, the Americans added another to make it a two-goal lead. Camped at the far post, Brendan Shinnimin took Adam Hughesman’s feed and tipped it past Reid, extending his playoff point streak to five games. But, with 3:37 left in the period, defenseman Jared Cowen pinched at the right corner, collecting the puck and feeding it to Matt Marantz at the near post. From there, Marantz fed the puck to Steven Kuhn in the slot, who tipped in his third goal of the post-season, pulling the Chiefs back to within one before the first intermission. After combining for 29 shots on goal through the first 20 minutes, the defenses took over as the two teams mustered just 12 total shots in the second period. Even worse for the Americans was the fact that they had only three of those 12. But, Owsley and the Tri-City defense were able to keep the Chiefs at bay headed into the final period of play. The second period also saw both teams get their only power play opportunities of the contest, although both were relegated to just 30 seconds of work due to the timing of the two infractions. In the third period, though, despite just four shots on goal, Tri-City regained their two-goal cushion. Just 5:25 after Reid kicked away Carter Ashton’s penalty shot attempt, Messier fired a bullet over the Spokane netminder’s shoulder, giving him two goals this post-season and Tri-City a 3-1 lead. Owsley, who stopped 34 of the 35 shots he faced, earned his 5th win of the playoffs and 17th of his career. Meanwhile, Reid allowed three goals on 18 shots while suffering his first regulation loss of these playoffs. Both teams finished 0-for-1 on the man-advantage. 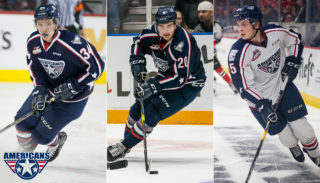 With Game 2 set for Sunday, April 10, the Americans will be gunning for a two-game lead in the best-of-seven series, while trying to earn a franchise-best sixth straight playoff win. Meanwhile, the Chiefs will be trying to avoid losing two straight games for the first time since Jan. 29 and Feb. 4. Coincidentally, in that two-game stretch, both losses came at the hands of Tri-City. 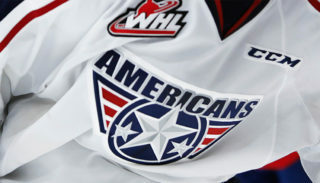 Fans can catch all the action live, via WHL WebTV, at the Americans’ home away from home, Kimo’s Sports Café in Richland. The game will also be broadcast live on NewsTalk 870 AM, starting with the Sterling Savings Bank Warm-up Show at 5:45 p.m.